VeryPDF Cloud PDF DRM Protector is your solution for secure enterprise file sharing and mobile collaboration with integrated digital rights management, mobile content management, endpoint data protection and data loss prevention. VeryPDF Cloud PDF DRM Protector uniquely combines encryption and de-duplication at the data source, enabling the most secure and efficient solution for anywhere, anytime, any device access. Digital Rights Management embedded in file sharing is essential to maintain effectiveness and efficiency within your organization without sacrificing enterprise file security. Digital rights management (DRM), sometimes referred to as information rights management (IRM), is critical for secure enterprise file sharing. VeryPDF Cloud PDF DRM Protector takes an information-centric approach to enterprise file security by ensuring that corporate information and data always stays under IT’s control. 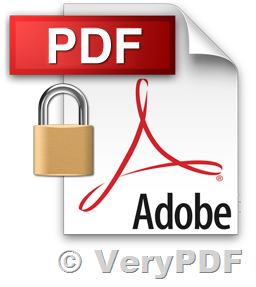 VeryPDF Cloud PDF DRM Protector achieves this through its U.S. patent-pending micro-containerization that embeds rights management (DRM/IRM) within documents themselves independent of file formats. The files shared across the corporate fence are DRM-encrypted and only usable by authorized recipients and within an authorized environment, even after they have been downloaded on a device not in IT’s control. Access rights: Provides control over who can view, edit, print, copy/paste, forward and download the documents or the information contained in them. Location control: Provides control over geo-locations and IP ranges from where the recipient can access the shared data. Expiration parameters: Document owner can set automatic expiration on the DRM-protected data. Revocation rights: At any time, IT can remotely revoke the permissions/rights for accessing the shared documents, even after a recipient downloads the files on his or her own device. Secure online document viewer: The viewing of shared documents by third parties can be restricted to read-only access through a secure web-based online document viewer, with full IT control on printing, copy/paste and screenshots. Digital watermarking: Watermarks (such as logo or copyright texts) can be added to each page of the document to discourage printing, screen capture or photo capture. This watermarking has options for embedding text, images or emails from the share link recipient. Complete file tracking: File usage is completely tracked such that an audit trail of activities — including opening, sharing, viewing, editing, forwarding and printing — is maintained at the level of the file, individual user and location. This entry was posted in PDF Security and tagged cloud pdf, pdf drm, pdf security. Bookmark the permalink.